Talk story with anyone from Hawaii and the topic of music and food eventually comes up. Both Hawaiian music and food are revered if acquired tastes, and ironically, it sometimes takes leaving the islands to appreciate both fully. The South Bay is blessed with a high concentration of displaced islandersit's sunny, we're close to the ocean, the airport and Las Vegas (the California Casino is an honorary Hawaiian territory). If you want to be down with Hawaiian culture, here's the short list. Friday mornings, 7am. KKUP-FM (91.5). Aloha Friday is a weekly Hawaiian music program that is broadcast from Cupertino. Hosts Uncle Vernon Chang and Auntie Luana Helm pull from their extensive record collections a steady stream of traditional and contemporary favorites and rarities. Catch the Internet broadcast at www.cocontyrls.com. Couldn't fit the pikake print fabric and kukui nut necklace in your luggage during your last trip? It's probably here. With the area's most extensive collection of aloha shirts, sundresses, T-shirts, jewelry, music, textiles, snacks and exotica, Sun Jose Hawaii blows away many Waikiki beach shops. It's also one of the few South Bay places where Zippy's frozen chili and Hawaiian Sun soda are available. 410 West Capitol Expwy., San Jose. 408.281.9262. With an islander-friendly menu and live music, Hukilau has emerged as the hottest nightspot in J-Town. Hawaiian bands play contemporary and classic music to a festive audience every Friday and Saturday. The drink list and extensive menu keep the party going. 230 Jackson St., San Jose. 408.279.4888. Also: 642 Ramona St., Palo Alto. 650.329.9533. Lots of Hawaiian music, clothing, trinkets, cookbooks. Ukulele prodigy Jake Shimabukuro did an in-store signing here. 219 Jackson St., San Jose. 408.297.7554. Specializing in snacks, clothing, fabrics, leis (shell, nut, silk and ribbon) and books. Hula classes on-site Monday-Thursday. 10065 E. Estates Dr., Cupertino. 408.873.9778. Want to see an offensive tackle from Waianae get misty? Nothing makes a Hawaii transplant homesick faster than talking, thinking or craving Hawaiian food. The cuisine has evolved from traditional items (kalua pig, poi, etc.) to creations that reflect the inhabitants: Spam musubi, saimin noodle soup, Portuguese sausage, malasadas, ahi poke and the monstrosity that is the Loco Mocohamburger patty served over rice with two eggs, macaroni salad and gravy. Who would have thought poi and Loco Moco would fall under the same Hawaiian cuisine banner? Until Sam Choy opens a restaurant here, here are some good locals keeping carb-counters awake at night. My favorite? A fully-loaded saimin with Spam musubi on the side. Hawaii's venerable plate lunchStyrofoam shells packed with marinated meat or fish, macaroni salad, pickled vegetables, steamed rice and optional brown gravyhearkens back to the plantation days. Immigrant workers tending the sugar cane and pineapple fields would break for kau kau and peek into each other's pots. Japanese brought tonkatsu, musubi, teriyaki and fish; Chinese had char siu and chow mein; Koreans brought kalbi and kimchi; Portuguese had the linguiça. Everyone had Spam (a shelf-friendly meat that stays good in humid temps, which explains its nascent popularity in Hawaii), rice and tea. Today, plate lunches are quick, filling and a metaphor for the multicultural stew pot that is Hawaii. The plate lunch legacy lives on in mom and pop drive-throughs and the ever-present L&L franchise. Thanks to some enterprising folks, the plate lunch is finally gaining popularity stateside. 1477 Plymouth St., Unit E, Mountain View. 650.960.6906. 7121 Monterey Rd., Gilroy. 408.848.1648. 1170 Alma St., Menlo Park. 650.323.6137. 4750 Almaden Expwy., Unit F, San Jose. 408.269.8793. 3048 N. Cabrillo Highway, Half Moon Bay. 650.726.8114. 506 Showers Dr., Mountain View. 650.948.8388. 711 El Camino Real, Redwood City. 650.369.0396. One of the few Bay Area buffets that serve a full luau spread daily: kalua pig, chicken long rice, lomi salmon, haupia and the taro root condiment/wall spackling, poi. A Touch of Aloha hosts the occasional tour stops by island performers like Sean Na'uauo. 148 North Milpitas Blvd., Milpitas. 408.946.9260. The venerable J-town dessert factory also runs a seasonal side business selling authentic Hawaiian shaved ice with azuki beans and vanilla ice cream. The line gets long during Obon and Nikkei Matsuri street festivals and summer Sundays, where Buddhist and Methodist church-goers line up for a sticky treat. 217 Jackson St., San Jose. 408.294.4148. Has there been a get-together with six or more Hawaiian folks without a guava chiffon cake from Aki's? Doubtful. The guava cake from this longtime San Jose bakery is an institution. 355 Meridian Ave., San Jose. 408.287.5404. Hawaii clubs at local universities provide a viable support network for homesick freshman. Halaus are groups dedicated to the preservation of the state dance, the hula. Santa Clara University boasts one of the largest concentrations of island kids achieving higher learning. Its Kamana'o O Hawaii club has a membership over 100 and puts on luaus and tailgates. www.scu.edu/SCU/Programs/Diversity/hawaii.html. 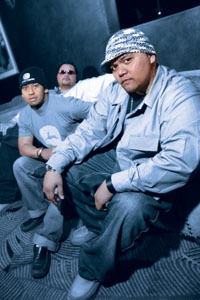 Its 14th annual luau with performances by Three Plus and Konane happens April 9. Visit http://hawaiiclub.Menlo.edu for more information. Contact: Keala Ching and Kaui Isa-Kahaku ([email protected]). 10065 East Estates Dr., Cupertino. Contact: Sandy Schiffbauer. San Jose. 408.226.2676. Contact: Linda Pi'ilani Danek ([email protected] pacbell.net). 3530 Lochinvar Ave., Santa Clara. 408.247.0500. Contact: Clark Kahekemalamalamaika'aina Bolivar, Jr. ([email protected]), Santa Clara. Contact: Carmina Chua (lehuananidance[email protected]), 929 Deer Meadow Court, San Jose. 408.403.1495. Contact: Makalea Kim ([email protected] aol.com) P. O. Box 53716, San Jose. 408.390.13930. From the March 16-22, 2005 issue of Metro, Silicon Valley's Weekly Newspaper.